This is the 6th installment of my ECG Video Blog. This 40-minute video is the final part of this 3-part series on a Clinical Look at Cardiac Arrhythmias from a Primary Care Perspective. 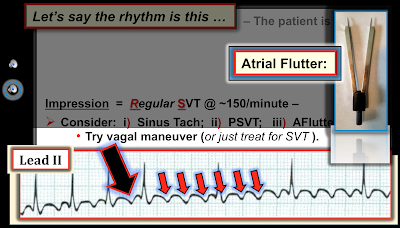 Focus in this Part 3 is on ECG diagnosis and management of the SVT Rhythms — including PSVT/AVNRT — MAT — Atrial Flutter — and Atrial Fibrillation. 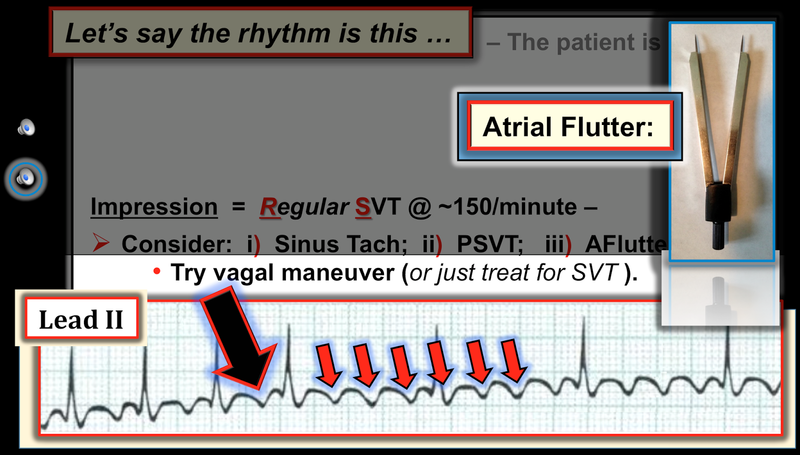 My goal in this 3-Part video series is to address the "art" of arrhythmia management from a primary care perspective. This includes cost-effective assessment as to whether a rhythm disturbance is present (with details on monitoring methods) — whether the arrhythmia is likely to be benign or more worrisome — and a practical approach to treatment. Below in Figure 1 — a sample of some issues discussed in this Part 3 (Video-Blog #6 = Blog #100). I believe this video brings the topic to life! Figure-1: Slide discussing use of calipers and carotid massage (large arrow) for diagnosis of AFlutter. NOTE — Enlarge by clicking on Figures — Right-Click to open in a separate window. GO TO: https://www.youtube.com/watch?v=K827SARyi04&feature=youtu.be on YouTube to view this ECG Video (40 minutes).